Bilateral normal tension glaucoma: Can this be nutritional? Normal tension glaucoma (NTG) also known as low tension glaucoma, presents with optic nerve head and visual field damage in the absence of high intraocular pressure (<21 mmHg). There are several patients of NTG seen in our clinics who have repeatable visual field defects, which may or may not correlate with the disc appearance, but are labeled as glaucoma. Ruling out ischemic, nutritional, and other causes of one-time damage are important before diagnosing an NTG. We report 3 such cases that were misdiagnosed and referred as NTG. All three cases were not glaucomatous and had typical features of nutritional optic neuropathy. 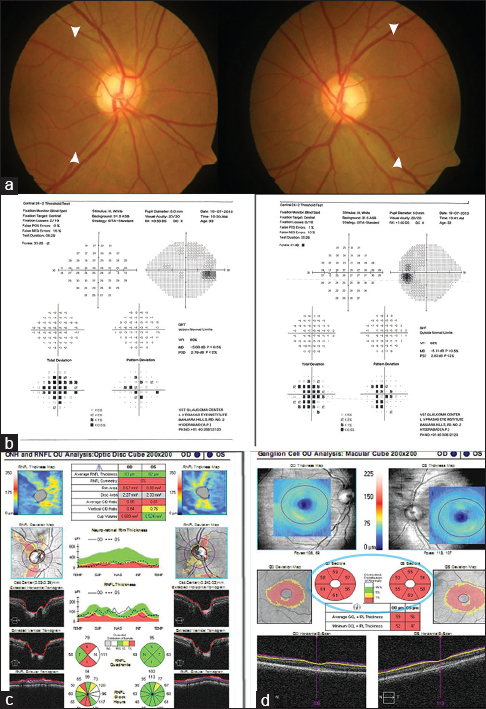 The typical clinical features, visual field and imaging abnormalities seen in these two conditions and their management is highlighted in this article. Misdiagnosis leads to inappropriate investigations and treatment, but more importantly would lead to worsening of undiagnosed underlying disease. Nutritional or toxic optic neuropathy (TON) is characterized by bilateral progressive loss of vision associated with dyschromotopsia and central or centrocecal scotomas. Nutritional optic neuropathy (NON) is often misdiagnosed as normal tension glaucoma (NTG) due to similarities in disc changes, pattern of the field defect, and retinal nerve fiber layer thinning. Vitamin B12 deficiency is specifically known to be associated with optic neuropathy. It is very important to differentiate the two conditions to avoid lifelong inappropriate treatment and their sequelae. A 54-year-old man was diagnosed as NTG and was referred to us. His best-corrected visual acuity (BCVA) was 20/30, and N12 in both the eyes. Color vision showed desaturation for all colors. There was early cataract and no relative afferent papillary defect (RAPD). Gonioscopy showed open angles in both eyes. Intraocular pressure (IOP) was 18 mmHg and 12 mmHg in the right and left eye, respectively. Fundus showed 0.7 cupping in right eye and 0.6 cupping in the left with temporal pallor and diffuse loss of nerve fiber layer (NFL) in the papillomacular bundle area (PMB) in both the eyes. With a suspicion of nutritional or TON, we revisited the history. He was a nonvegetarian by diet, nonalcoholic and nonsmoker, however had inflammatory bowel disease for 25 years and was on treatment for the same. A 33-year-old man who was suspected to have NTG and was referred. His BCVA was 20/40 and N6 in both eyes. Color vision was normal. The anterior segment was unremarkable with no RAPD. Gonioscopy showed open angles. IOP was 18 mmHg and 16 mmHg in the right and left eye, respectively. Fundus showed 0.8 cupping with temporal pallor and diffuse loss of NFL in the PMB region in both eyes. He was a strict vegetarian, nonsmoker, and nonalcoholic. A 13-year-old male presented with gradual decrease in vision in both eyes for 1 year. His BCVA was 20/80 for distance and N12 for near in the right eye; 20/50 for distance and N12 for near in the left eye. His anterior segment was unremarkable. Gonioscopy showed open angles. IOP was 18 mmHg and 12 mmHg in the right and left eye, respectively. Color vision showed desaturation for all colors. Fundus examination showed 0.7 cupping with temporal pallor and diffuse loss of NFL in the PMB region in both eyes. He was a strict vegetarian. All the three cases were diagnosed at different places by general ophthalmologists as NTG and were prescribed topical anti glaucoma medications (AGMs). [Table 1] gives the results of hemogram, serum Vitamin B12, and folic acid levels of the three cases. 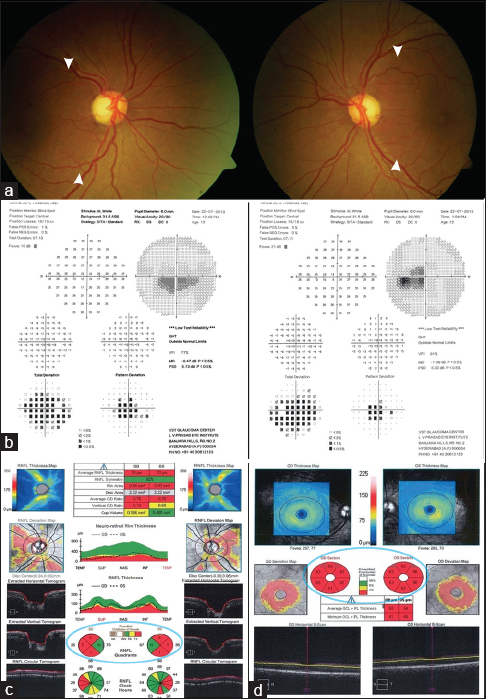 The typical findings of NON on color fundus photographs [Figure 1]a, [Figure 2]a and [Figure 3]a, the HVF [Figure 1]b, [Figure 2]b and [Figure 3]b. Moreover, optical coherence tomography (OCT) [Figure 1]c, [Figure 2]c, [Figure 2]d, [Figure 3]c and [Figure 3]d are shown in the figures. Topical AGM was stopped in all the three patients. All the three patients were given intramuscular injection of methylcobalmin 1000 μg daily for 1 week, followed by weekly for 6 weeks and monthly for 6 months. Oral folic acid tablets 5 mg/day was also prescribed. 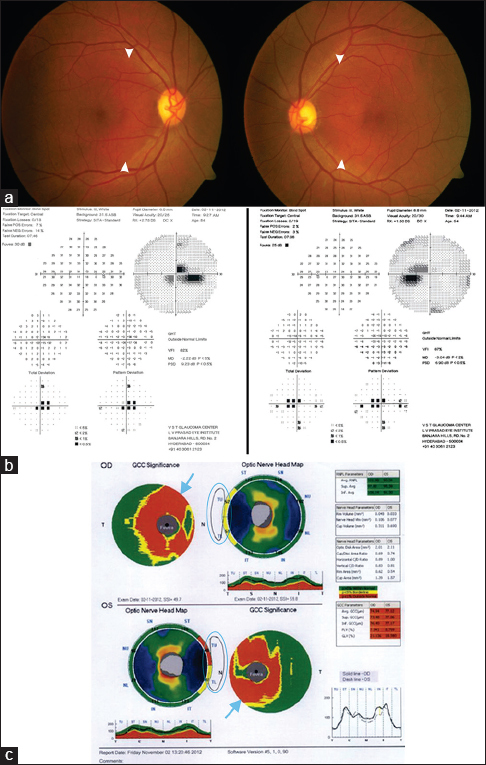 The visual acuity (VA) improved to 20/25 and N6, after the supplementation in case 1 and case 2 at 6 months follow up. The first patient (case 1) requires lifelong parenteral therapy due to malabsorption and the other two were shifted to oral supplements. The VA did not improve further after the treatment in case 3. He was lost to follow up after 3 months. The visual fields and OCT findings remained unchanged in all the three cases. The IOP was within normal limits in all the three subjects during the follow up period. This report highlights the diagnostic features and the differentiating features of NON and NTG. NON, generally presents with gradual, painless loss of vision, which is progressive, however, VA never worsens beyond 20/400 and does not cause complete blindness. Bilaterality is the rule, but may be asymmetrical. Dyschromatopsia is usually present and patients may perceive red color less brighter or have overall desaturation of colors. RAPD may be absent when involvement is bilateral and symmetrical or may be present when pathology is asymmetrical. The optic disc may be normal or slightly hyperemic in the early stages of the deficiency, with optic atrophy setting in later manifesting as temporal pallor. NON is associated with diffuse loss of temporal NFL involving the PMB. The field defect in an NTG respects the horizontal midline; however in NON, the centrocecal scotoma crosses the midline involving the other hemifield as well. OCT typically shows thinning of macular NFL and ganglion cell complex. Why does the B12 deficiency cause optic neuropathy? The pathophysiology is postulated to be energy depletion and accumulation of free radicals, leading to demyelination followed by axonal degeneration and neuronal death. PMB fibers are most susceptible to injury in NON and TON as they are small, unmyelinated, and have high-energy demand. The diagnosis of a NON is based mainly on detailed medical history, clinical and laboratory results. Humans are completely dependent on external sources for B12. The sources rich in Vitamin B12 are animal products and dairy products. Vitamin B12 deficiency is encountered with strict vegetarian diet, aging, malabsorption due to pernicious anemia, celiac sprue, infestation with fish tapeworm, following gastric or ileal resection, following bariatric surgery and the chronic carriage of Helicobacter pylori. The recommended daily allowance is 2.4 mcg/day in adults and 2.6 mcg/day in pregnant and lactating women. Understanding the cause of deficiency is important as oral supplements may not be helpful if the cause is malabsorption. The available options include oral and parenteral (intramuscular or subcutaneous) preparations of hydroxy or cyano or methyl cobalamin. Favorable recovery with almost complete return of vision is obtained when the treatment is initiated early. Complete recovery may not be possible with delayed treatment as was seen in our case 3, but may help prevent further loss. Although both NON and NTG have distinctive features of presentation, subtle similarities could be misinterpreted leading to improper diagnosis and treatment. Hence, detailed understanding of the two conditions is important. This report highlights the importance of acquiring appropriate history, detailed clinical evaluation, and appropriate investigations in the diagnosis of NON and ruling out NTG. Early diagnosis and prompt initiation of supplementation can reverse the visual loss in NON. The importance of life-long treatment and supplementation should be emphasized. Phillips PH. Toxic and deficiency optic neuropathies. In: Miller NR, Newman NJ, Biousse V, Kerrison JB, editors. Walsh and Hoyt's Clinical Neuro-ophthalmology. 6th ed. Baltimore, Maryland: Lippincott Williams and Wilkins; 2005. p. 447-58. Orssaud C, Roche O, Dufier JL. Nutritional optic neuropathies. J Neurol Sci 2007;262:158-64. Hvas AM, Nexo E. Diagnosis and treatment of Vitamin B12 deficiency – An update. Haematologica 2006;91:1506-12.